This week’s Top Ten Tuesday topic is a Holiday Gift Guide so I decided to post about some book-related items that would be perfect for the bookworm in your life. 1. Bookmark: A bookworm can never have too many bookmarks. Not only are the super helpful for marking your place in your book – they can be the perfect decor for a bookcase. You can find bookmarks for just about any book or theme. 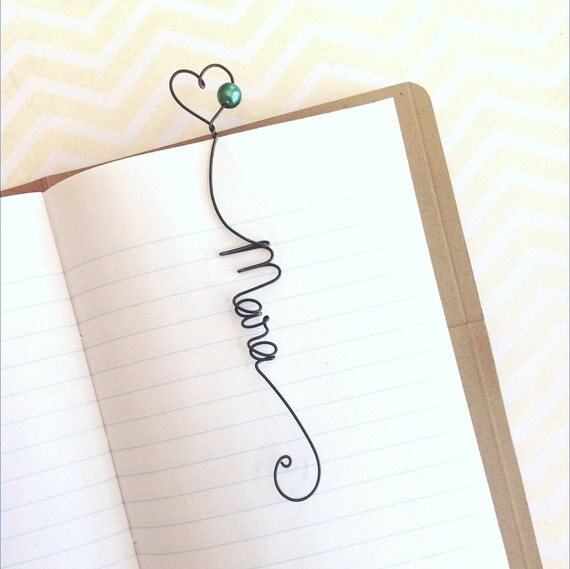 I love these personalized bookmarks from kraze4paper on Etsy. 2. Jewelry: There are tons of options for fandom jewelry. You can find necklaces, earrings, bracelets, etc for just about any book, movie, tv show, game you can imagine. 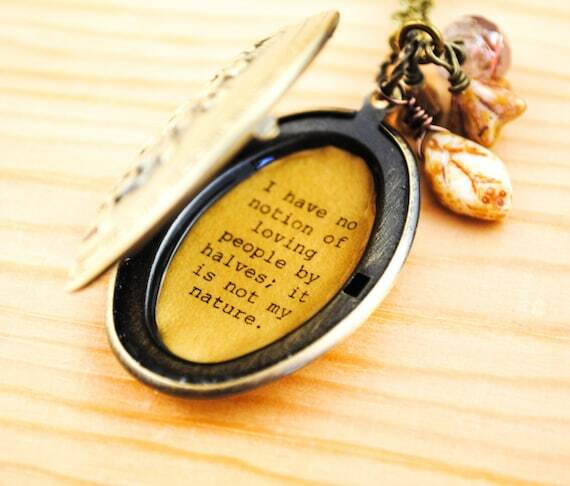 Like this Jane Austen inspired locket from busybeezchickadeez on Etsy. 3. Bookstore/E-Reader Gift Card: If you aren’t sure what book to get your parent/sibling/friend for the holidays, a bookstore or e-reader gift card is a great way to go. You get to support their love of reading, and they get to buy a book they are going to love. 4. Art print: Art prints are a great gift for bookworms who like to decorate their houses with pictures relating to books. Plus you can spend as little or as much as you would like to on a print – there’s a print for every budget from stretched canvases to printable pdfs that you frame yourself. One of my favorite places to look for Art Prints is Society6. There are so many prints to choose from! 5. Mug: Bookish mugs are perfect for the book and coffee person in your life. And you can find them for just about any book or fandom you can think of. 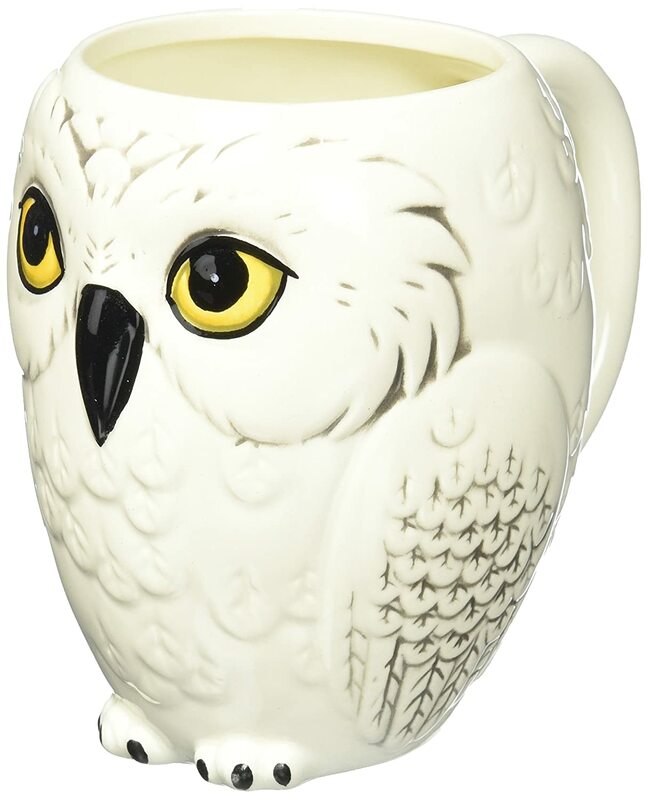 I love this Hedwig mug from Amazon. 6. Candle: Book themed candles are a great gift – and there are so many wonderfully smelling ones to choose from. 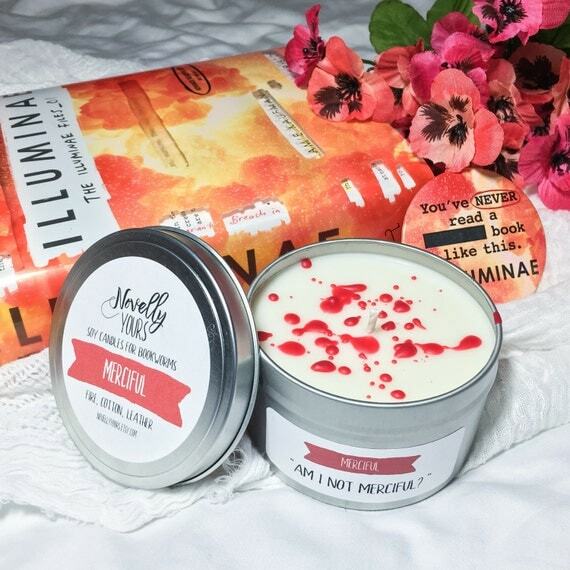 These soy candles from NovellyYours are so cute – I pretty much want to order all of them! 7. Pillow: I love book themed pillows. They are a great way to add color to your room with a subtle (or not so subtle) nod to your favorite books. 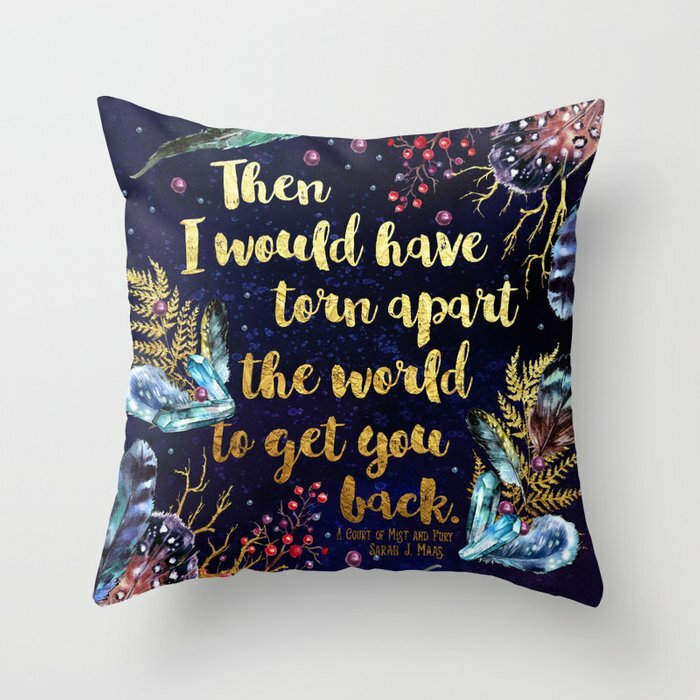 I ordered this pillow with a quote from A Court of Mist and Fury by Sarah J Maas from Society6 designed by Evie Seo, and I love it! Its such great quality and looks perfect in my living room. 8. Tote: Tote bags are a great gift for bookworms. They can be used to carry new books home from the library or their favorite bookstore. And since you can get them with book quotes or pictures, they can carry non-book items in them while still showing off their love of books. 9. Book Box Subscription: Book Box Subscriptions are a great way to give book even if you aren’t sure which book to give. You can pick a subscription based on what kinds of books your recipient likes to read: young adult, literary fiction, middle-grade, thriller, etc. Plus there are lots of different kinds of subscription boxes: some include bookish goodies, some have multiple books, or signed books. I personally have an Uppercase subscription which I absolutely love. But, other popular boxes include OwlCrate, LitCube, Bookcase Club, The Bookworm Box, The Bookish Box, BooklyBox, etc. 10. Scarf: You can find tons of great scarves with bookish themes. My personal favorites are ones that have book passages printed on them. Its a great way for a book lover to carry their favorite book with all day long. 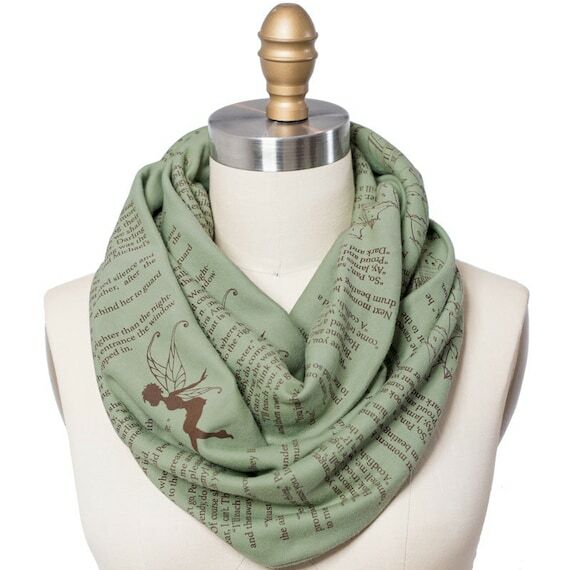 Like this Peter Pan scarf from storiarts on Etsy. I hope you are able to find the perfect gift for every bookworm on your list! *Top 10 Tuesday was created by The Broke and the Bookish. Head on over to the blog to find topics and participate each week.